Our hearts go out to Haiti as the country tries to recover from the devastating earthquake. As celebrities draw attention—and donations—to relief efforts through certain charities, we want to echo their call for help. These organizations are committed to making a difference. If you want to show your support for the people of Haiti, a wonderful way is with a necklace from Jewelry for a Cause, which is donating 50% of proceeds from the necklace to Doctors Without Borders’ efforts in Haiti. 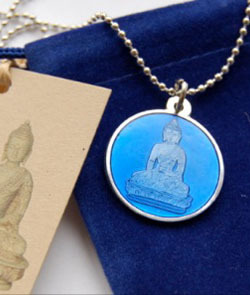 The Buddha is seated in Varada mudra, the pose of charity and compassion, and its deep blue color symbolizes medicine and healing. Let’s send that message of hope to Haiti. Price: $25; 50% of proceeds donated to Doctors Without Borders. Yéle Haiti was started by Grammy-Award winning singer Wyclef Jean. Yéle Haiti uses funds to create programs, including scholarships for children, food distribution, and literacy and arts in schools, among others. To donate $5 to the Yéle Haiti Earthquake Fund, text “Yele” to 501501 (it’s charged to your cell phone bill), or donate directly through their site. Not On Our Watch was founded by Don Cheadle, George Clooney, Matt Damon, Brad Pitt, David Pressman and Jerry Weintraub to bring attention to international crises and their victims. The organization has already donated $1 million to Haiti relief efforts. Ben Stiller has been working with Save the Children for several years to raise funds to build a school for children in Haiti. But for now, all donations to his charity are being redirected to UN Agencies to help provide relief. Stiller also recently announced the launch of the Haitian School Initiative to help provide temporary schools for Haitians displaced by the earthquake. And stars like Gisele Bündchen, Sandra Bullock, Brad and Angelina, and Madonna have all reached into their pockets and donated to noteworthy foundations such as the Red Cross, Doctors Without Borders and Partners in Health. We ask that you visit their sites and please consider doing the same.